A visit to Iran by Board members of Academy of Motion Pictures Arts and Sciences (Oscar) in early spring was among the most important artistic developments in the country. It was important because since the victory of the Islamic Revolution no American artist had officially travelled to Iran. The trip was surrounded by controversies and although it provided a good ground for cultural interactions between the two countries’ filmmakers, some circles protested to it. During the visit, two specialized meetings were held attended by Oscar Board members and Iranian filmmakers, which greatly echoed in the Iranian print media. The American visitors also toured some ancient Iranian cities. Back in the United States, they talked about hospitality of Iranians and positive results of their trip. 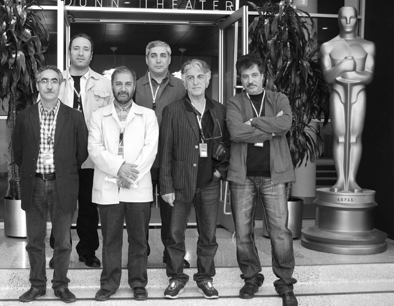 Almost six months after that trip, the American group invited eleven Iranian filmmakers to visit the United States to get abreast of filmmaking conditions and facilities in that country. Mohammad Mehdi Asgarpour (director and chairman of House of Cinema), Ebrahim Hatami-Kia (one of the most renowned war genre directors), Reza Mirkarimi (director and former managing director of House of Cinema), Rakhshan Bani-Etemad (director), Amin Tarokh (actor of Mother), Farhad Tohidi (screenwriter), Mojtaba Raei (filmmaker), Reza Kianian (actor of 7:05), Alireza Raeisian (filmmaker), Fatemeh Mo’tamed Arya (leading actress of Gilaneh), and Mojtaba Mirtahmasb (documentarian) were on the list. The group excluding the last two (Mo’tamed Arya and Mirtahmasb) set out for the United States on October 9. Newspapers and news services then conducted interviews with Mo’tamed Arya and Mirtahmasb inquiring about why they were left behind. They were told that both of them had gone to the airport only to be told that they had been banned from leaving the country. During the Iranian group’s stay in the United States, some Iranian movies like As Simple as That (Mirkarimi), 7:05 (Asgarpour), Gilaneh (Bani-Etemad), Red Rose Lady (Mirtahmasb), Journey to Hidalou (Raei), In the Name of Father (Hatami-Kia), Mother (Ali Hatami), and Havana Case (Raeisian) were screened. The trip took eight days and what follows is a brief report on daily programs of the Iranian filmmakers. Day 1: At 17:00 local time, Tom Sherak, the new president and Sidney Ganis, the former president of the Academy of Motion Picture Arts and Sciences, and five members of the academy who had visited Tehran in March on an invitation from the Iranian House of Cinema welcomed the Iranian delegates and took them to a dinner banquet where they talked about issues of mutual interest. Afterwards, there was a face-to-face meeting between the Iranian filmmakers and an audience at the University of California at Los Angeles (UCLA) which was presented for 1.5 hours by Sid Ganis. During the meeting, Sid Ganis first pointed to special features of the Iranian cinema and said that Board members of the Oscar Academy now believed that the Academy was not special to the American cinema, but was a film academy and, therefore, they had tried to reach out to other countries. He added that they had first gone to Vietnam before visiting Iran. In their visit to Iran, they had noticed that the Iranian cinema was more than 100 years old which was roughly equal to the American cinema. They had come across surprising facts in Iran and found themselves faced with a lively cinema and an educated people. Expressing regret that two expected guests, Fatemeh Mo’tamed Arya and Mirtahmasb, had been banned from leaving the country, he expressed hope that they would join the Iranian filmmakers in the United States. Then he asked the Iranian filmmakers why they had accepted the invitation to be in the United States? Answering that question, Mohammad Mehdi Asgarpour, first regretted the absence of two Iranian filmmakers in the program and added, “One of our goals is cooperation on co-productions and another goal is to gain personal experiences.” The meeting ended with questions and answers on filmmaking in Iran. Then As Simple as That (Reza Mirkarimi) was screened at the movie theater of UCLA, which was totally full. At the end, Mirkarimi answered audience’s questions on his motives for making the film.